Posted October 10, 2017 & filed under Safety. Forklifts are a common sight in many industries. Whether used in warehouses, manufacturing plants, retail applications or elsewhere, forklifts are crucial tools in the daily operations and supply chains of most businesses. Because of this frequent level of use, many operators and nearby pedestrians can become complacent regarding safety protocols. This complacency can have many ill effects, including asset damage, employee discipline, fines, injury, and even death. According to the Operational Safety and Health Administration (OSHA), an average of 100 emplo yees are killed each year in forklift accidents, and as many as 95,000 total forklift accidents occur on an annual basis. In many cases, these accidents are avoidable. While Toyota forklifts are carefully manufactured with safety top-of-mind, safety protocols must be followed correctly for operators and pedestrians to be protected. Beyond behavioral causation, injuries and fatalities also stem from detectable equipment failure when employees do not properly inspect and assess equipment before use. Safety regulators, forklift manufacturers and many companies encourage that forklifts be inspected before operation, but these inspections are often neglected or poorly documented. Safety is an obvious reason that these inspections should be conducted regularly, and so is compliance – thousands of dollars in fines could occur based on failure to determine forklift safety prior to operation. 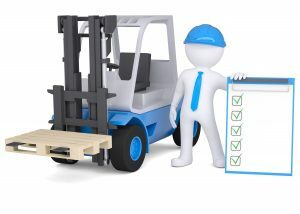 Protecting company reputation, finances, property and lives against this sort of failure and related accidents typically requires only one measure be taken – pre-operation forklift inspections carried out according to a thorough checklist. In addition to the safety and compliance related aspects of regular forklift inspections, there is also a cost-savings component related to proactive discovery of issues and predictive maintenance. Discovering problems, or festering problems, sooner helps limit and plan downtime and can be an easier, less expensive repair than a full blown issue. Creating and adhering to a pre-operation inspection regiment is not inherently difficult, but it does take continuous corporate support and a high level of operator discipline. PRE-OPE RATION INSPECTIONS: WHAT MUST YOU DO? must be conducted, there are suggested best practices readily available. WHAT SHOULD GO IN A CHECKLIST? Proper pre-operation inspection protocols are vital in helping avoid workplace injury, and they should not be difficult to manage. Need help creating your own checklist? Contact Allied Toyota Lift today!